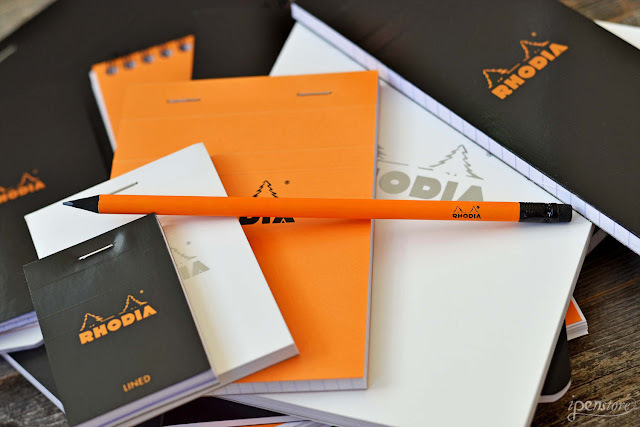 Rhodia notebooks are famous for their simple clean design. Acquired by Clairefontaine in 1997, the company was originally founded in Lyon, France in the early 1900s by two brothers. The logo of two Spruce trees represents the brothers- similar yet not the same, linked together by a line to symbolize how they worked together. The Rhône River travels through Lyon, and the people there are called "Rhôdaniens." The name of the company comes from this word. 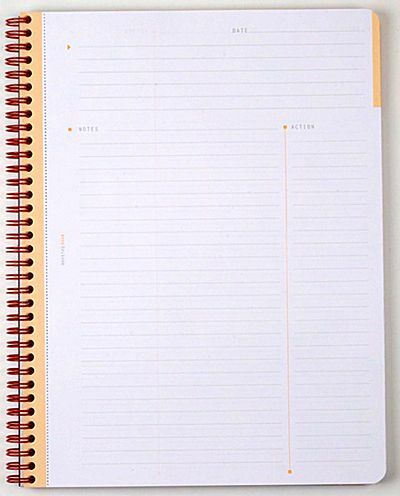 The original orange notebook - unchanged since it was first created in 1932. 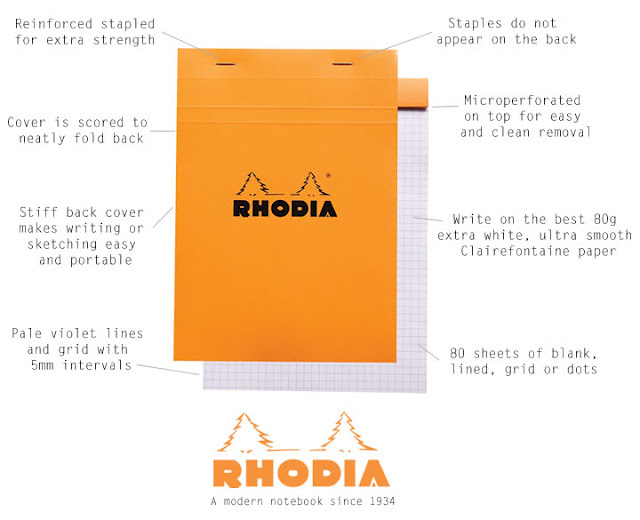 The Rhodia notebook, originally an side product for the company, eventually became its best seller. Customers loved the quality materials and the scored front cover. The iconic orange cover dates back to 1934 and this look has not changed. The notebook has been modernized and improved in several other ways, however. It's now coated for strength, and each sheet is micro-perforated, and the paper is made by Clairefontaine in the very same mill. It's 80 gsm, fountain pen friendly, ultra smooth and bright white. The wirebound Meeting Notebook has a waterproof cover and the wires are doubled to keep them strong and from catching on anything. Look below to see inside! Each page has a spot for the date, notes, and actions to take making note taking enjoyable. Wirebound meeting book (6-1/2" X 8-1/4") Pre-printed pages with date, notes, and action to make note taking easier. The paper is truly great for fountain pen writing! You will find no bleed through on your pages, and your nib will simply glide over the paper. The micro perforated pages come out easily and cleanly every time. 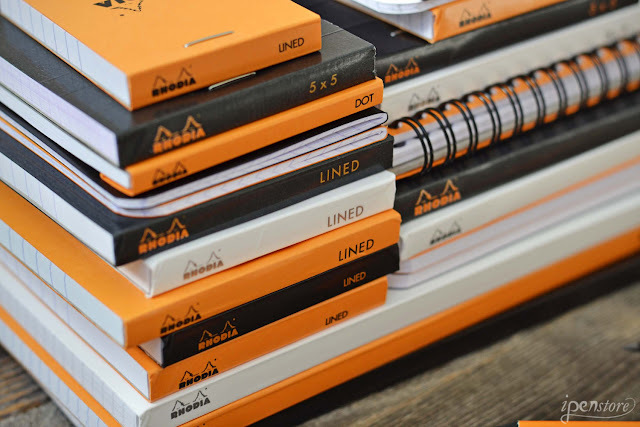 Rhodia pads come in many sizes. We sell them from the mini #10 (2"x3") to the large #18 (8-1/4" x 11-3/4"). The lavender dots and grids on the dot and grid paper won't show up in a photocopy! 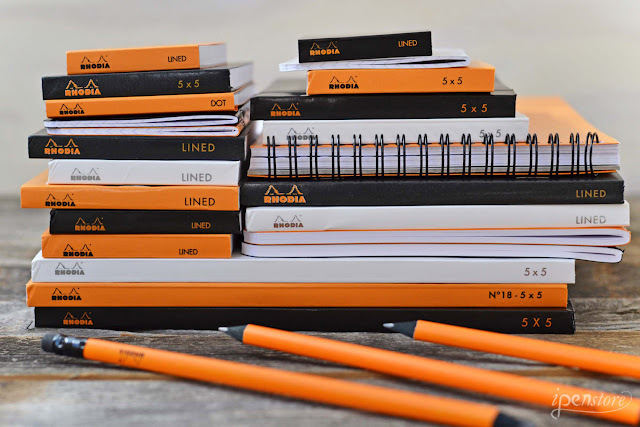 Rhodia triangular shaped pencils are know for the barrel that is comfortable to hold and won't roll off your desk or table. 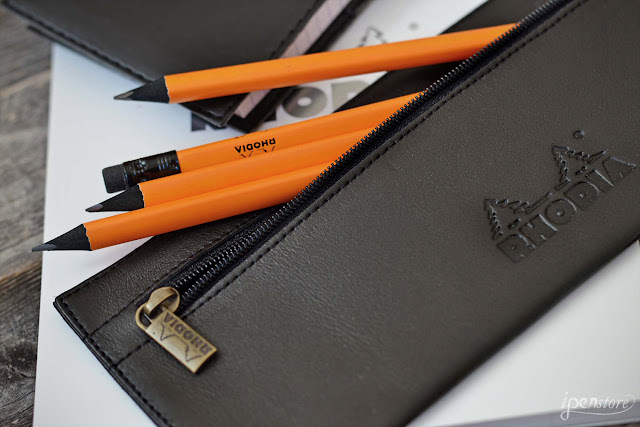 The soft leather zippered pencil case has a metallic zipper.